Spetisbury: the old station site click here has been tidied and has a picnic area and information boards. Spetisbury Rings is an ancient British camp close to the old station and accessible by public footpath for views over the Stour Valley. Spetisbury Apple Day 29 September 2018 click for poster. In Blandford: Otters are often seen from the bridge where the Trailway crosses the Stour from Stour Meadow to the M&S car park - they even have a FaceBook page. Blandford has a Town Museum, a Fashion Museum, the historic church and other Georgian buildings, and the Hall and Woodhouse Brewery Visitor Centre. The town centre has shops, pubs and cafes. 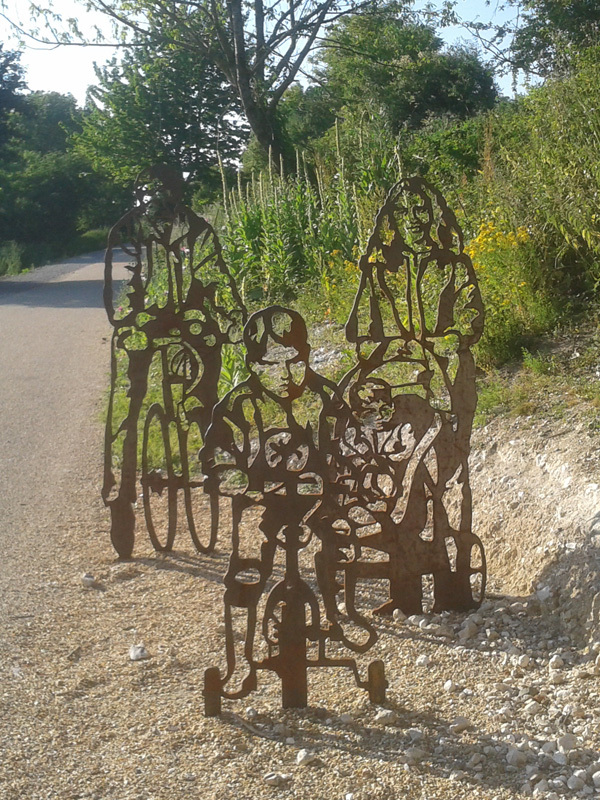 Whilst you are travelling between Stourpaine and Blandford, you may come across some mysterious sculptures next to a bench. Click here to see them. Shillingstone Station: The station has been restored with a museum and cafe. Click for details. Fiddleford Manor English Heritage site (DT10 2BX off A357) has free parking close to the Trailway and the Manor is an amazing mediaeval building. Close to The Fiddleford Inn, one of our sponsors.